So last night foa my birthday, we went out foa dinnah. We get plenny choices around hea, but I really wanted local kine grindz. I really wanted to holoholo kaʻa up to Patrickʻs Hawaiian Cafe in Vancouver, but ho, da traffic alla way up I-205, cross da bridge ova da Columbia Rivah, den Vancouver. We wen decide dat we going go dea when nomo da traffic. 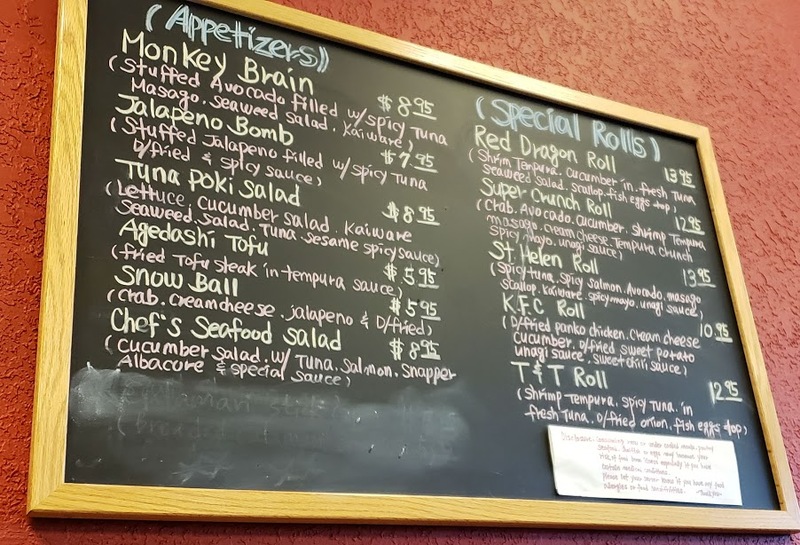 Instead we wen go to Bento Plus in Gresham, ten minutes from us, dat neva disappoints. We both wen decide on da Tempura Plate. Was so ʻono! With extra ginger foa me. Da dipping sauce no stay in da peecha, but had um. Dis is my comfort food foa realz. Dis menu stay on da wall. I going pass on da Monkey Brain but. Only because I no like spicy tuna. Same ting wit da jalapeño. But next time I going try da agedoshi tofu. Feliz cumpleaños a mí! Hauʻoli lā hānau iaʻu. Had choke good wishes from friends and ʻohana near and far. Was a good ending to da day, yeah? And not pau yet, cuz I wen get some futo maki foa today! We have to go here sometime, Mom!! I’d love to!!!! Let’s do it! Love that you stopped by! I hope it was a good day through and through. Happy belated birthday!